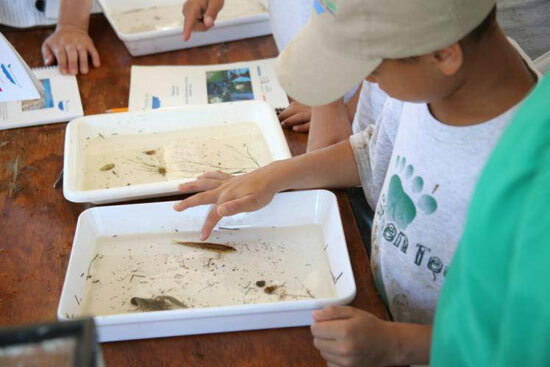 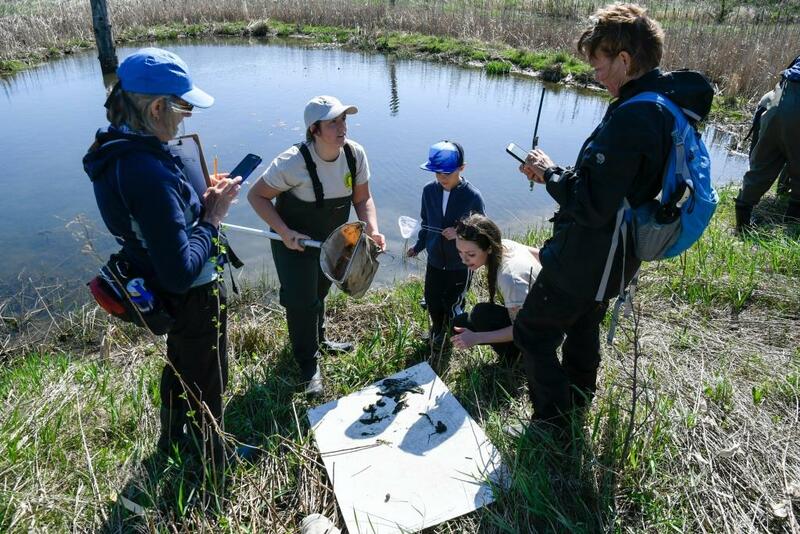 Home » Gallery "Onondaga Lake Conservation Corps"
May 2018 - Macroinvertebrates include worms, insect larvae, crayfish, snails, mollusks, and similar small organisms that are an essential part of an ecosystem’s food chain. 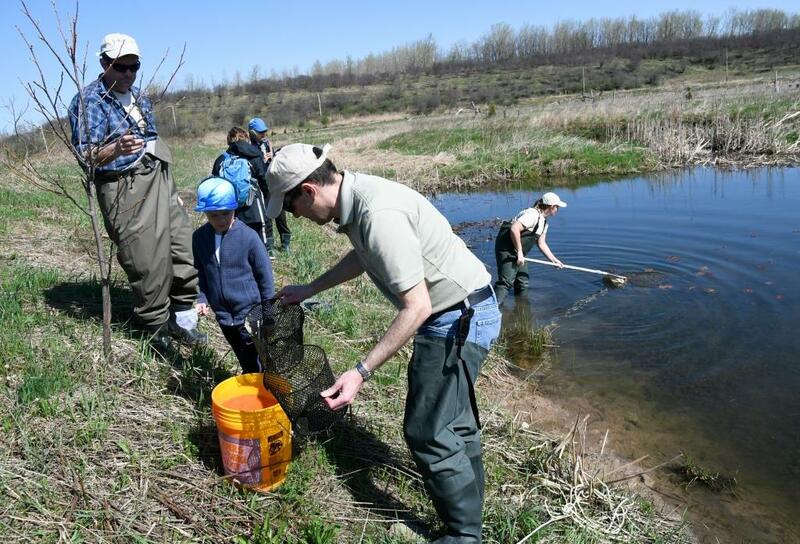 May 2018 - D-frame nets work well to sample macroinvertebrates on stream or pond bottoms. 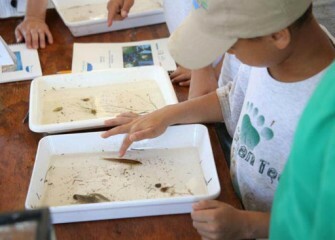 The health, abundance and diversity of macroinvertebrates are indicators of a water body’s health. 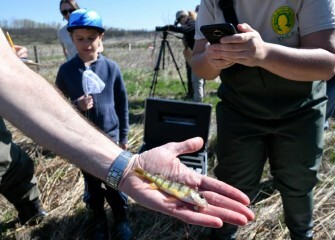 May 2018 - After observation, all fish including this juvenile yellow perch are returned to the Geddes Brook wetlands pond. 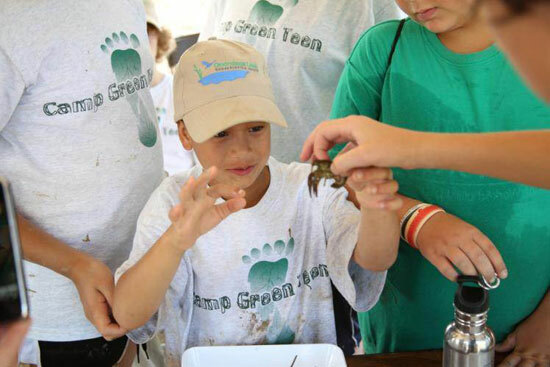 May 2018 - Seven-year-old Josh Gates watches as captured organisms are transferred into a bucket of water for further observation. 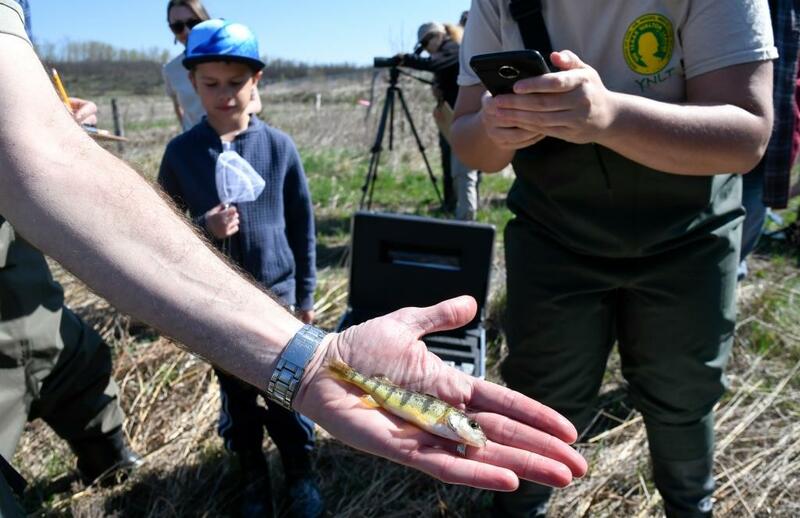 May 2018 - Mark Arrigo, Corps volunteer and scientist with Parsons, reels in a minnow trap set earlier to catch small fish and other species. 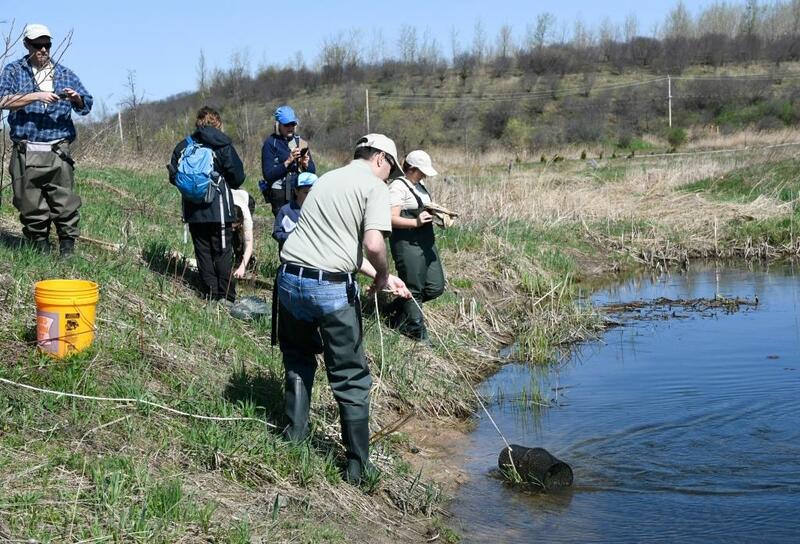 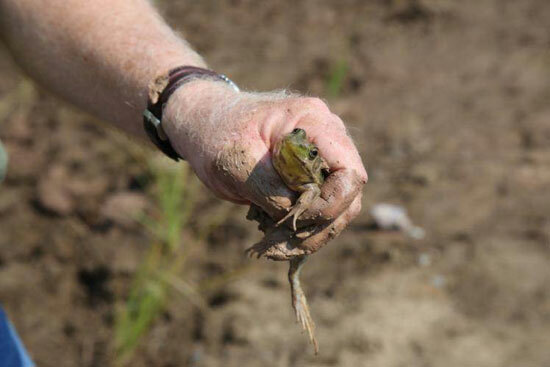 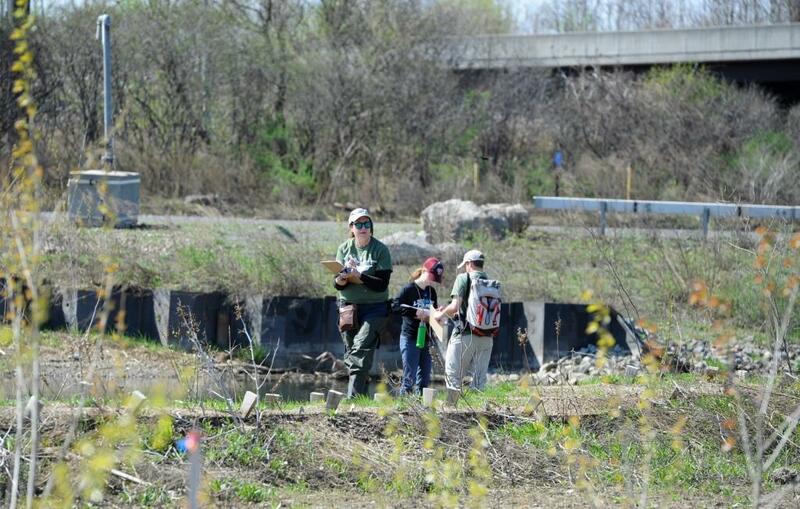 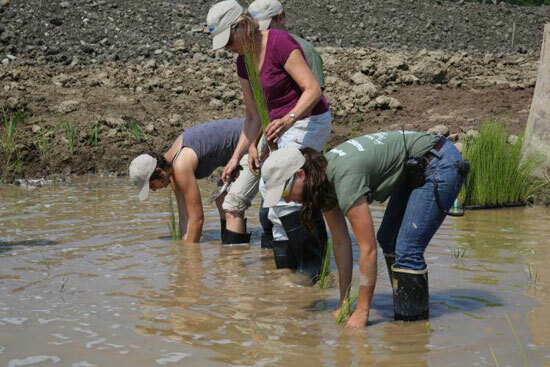 May 2018 - Volunteers log plant and animal species in the newly restored wetlands at Geddes Brook, and at the western and southwest shorelines of Onondaga Lake. 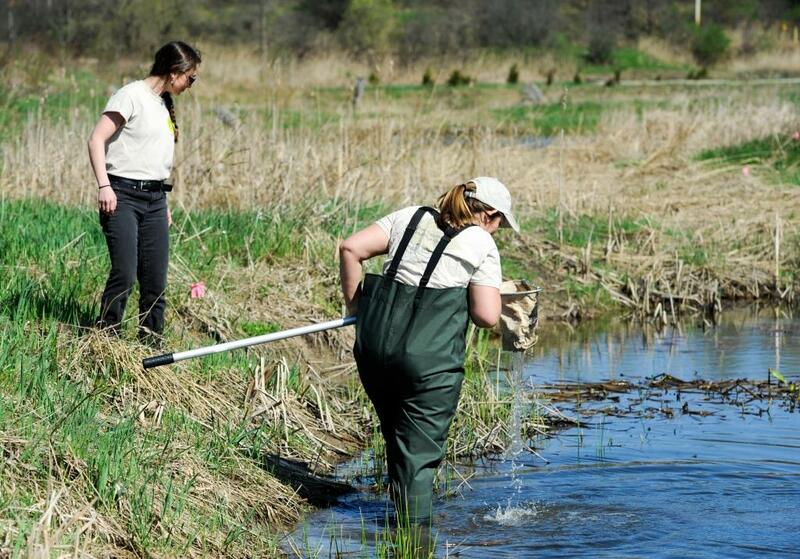 May 2018 - Candace Schermerhorn (right) of the Young Naturalists Leadership Team uses a D-frame dip net to search for organisms on the bottom while YNLT Project Coordinator Shannon Fabiani looks for amphibians and other species along the water’s edge. 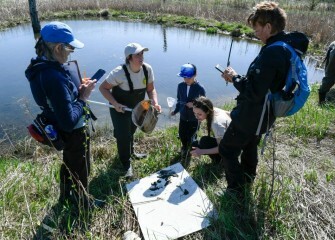 May 2018 - A water quality meter is used to measure temperature and dissolved oxygen. 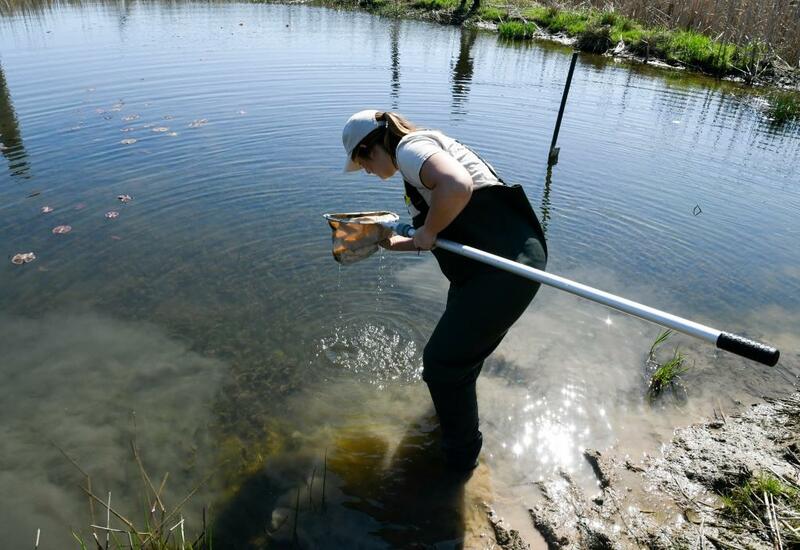 Ample dissolved oxygen is important for the health of aquatic animal and plant life, as well for decomposition of material on the bottom. 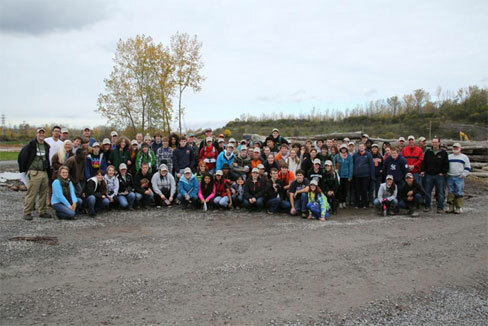 May 2018 - Volunteers with the Onondaga Lake Conservation Corps and the Young Naturalists Leadership Team (YNLT) of Izaak Walton League fan out to inventory plant and animal species. 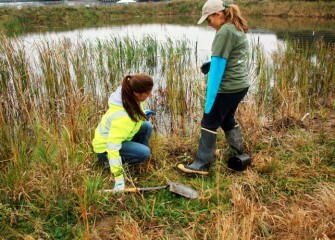 October 2014 - Sixty-eight community volunteers and experts participated in the 9th Onondaga Lake Conservation Corps event. 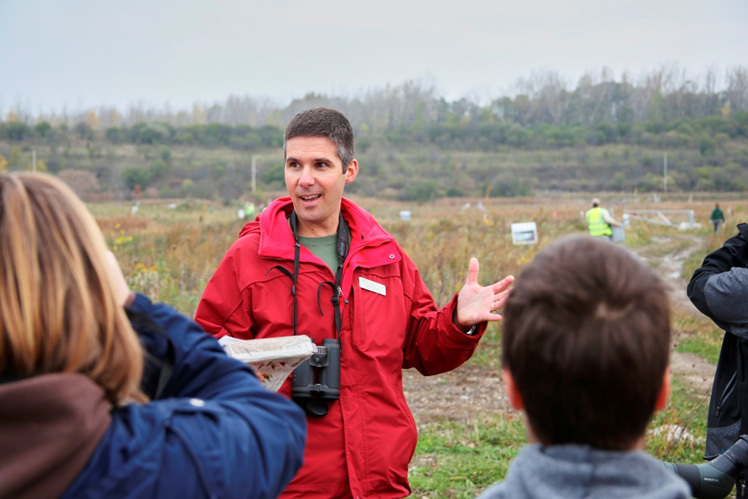 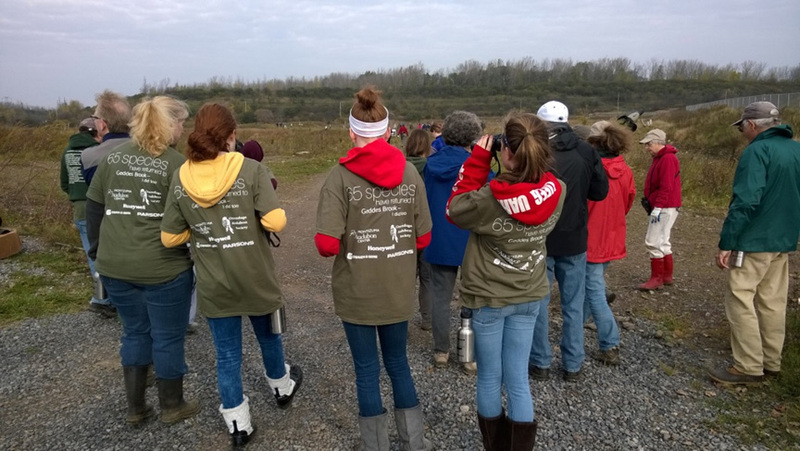 October 2014 - Environmental stewards of all ages fanned out to add more native plants and observe some of the 65 fish and wildlife species now inhabiting the restored Geddes Brook wetlands. 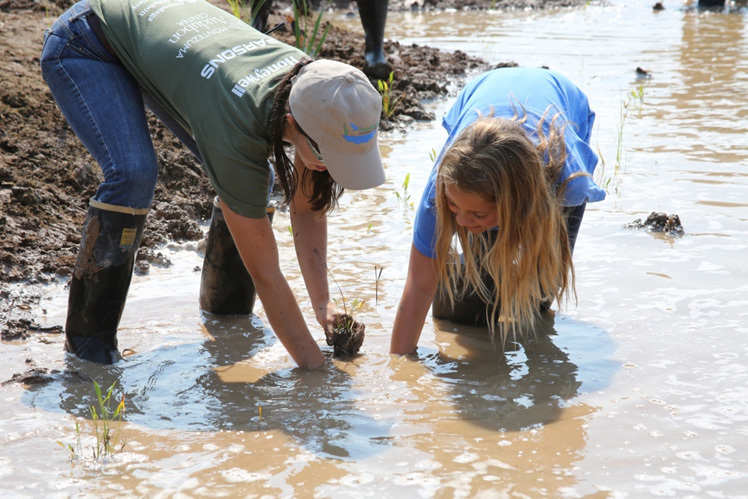 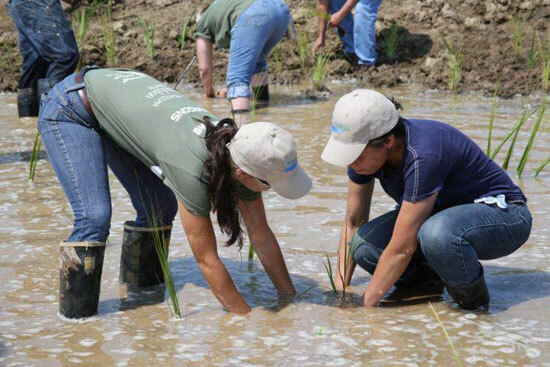 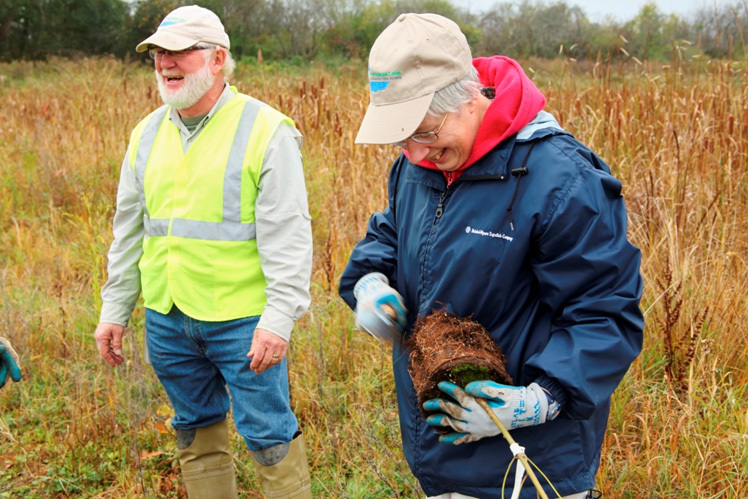 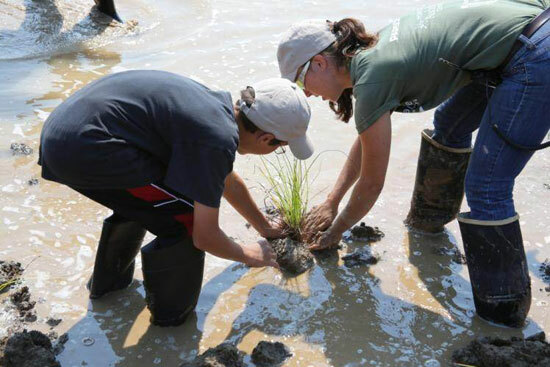 October 2014 - Hailey Higgins (right), with Parsons senior scientist Heather Philip, returned to Geddes Brook wetlands to install more native plants and experience firsthand the habitat development since 2012. 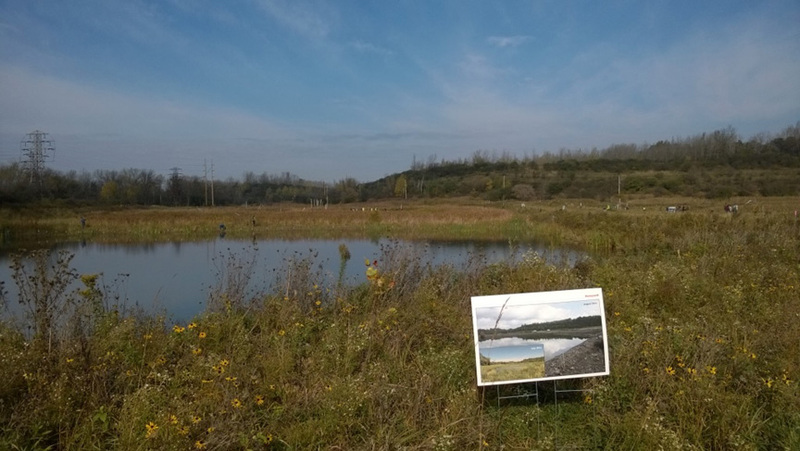 October 2014 - Today Geddes Brook wetlands is a flourishing ecosystem. 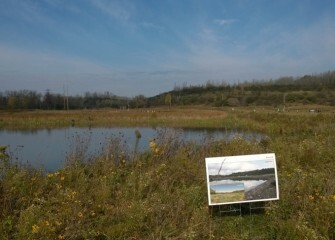 Posters were placed during the October 2014 event to remind participants how the wetlands appeared just two years ago. 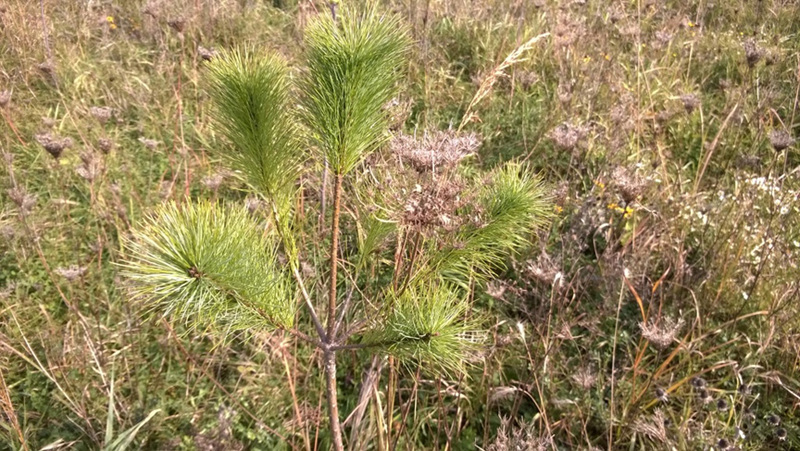 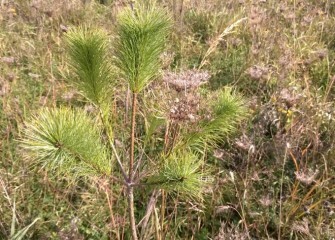 October 2014 - This young white pine and many other native grasses, shrubs, and trees previously planted are now thriving in the reestablished Geddes Brook habitat areas. 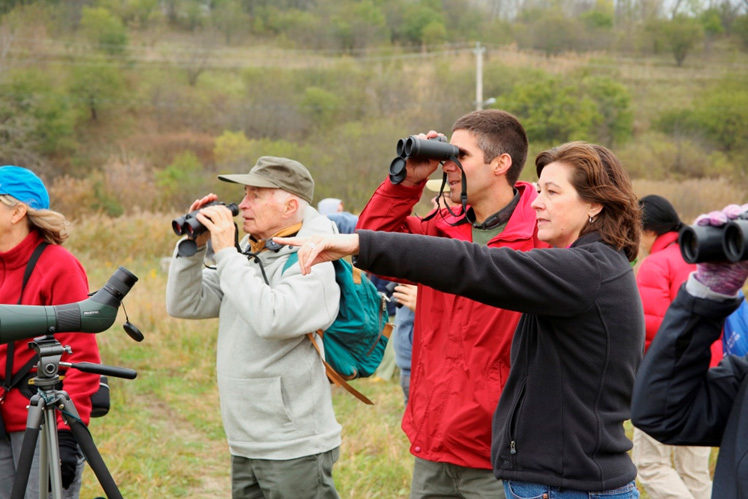 October 2014 - Before embarking on a walk to inventory birds, Montezuma Audubon Center director Chris Lajewski briefs birdwatchers on identifying species. 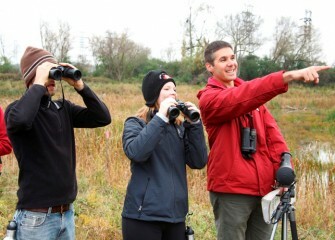 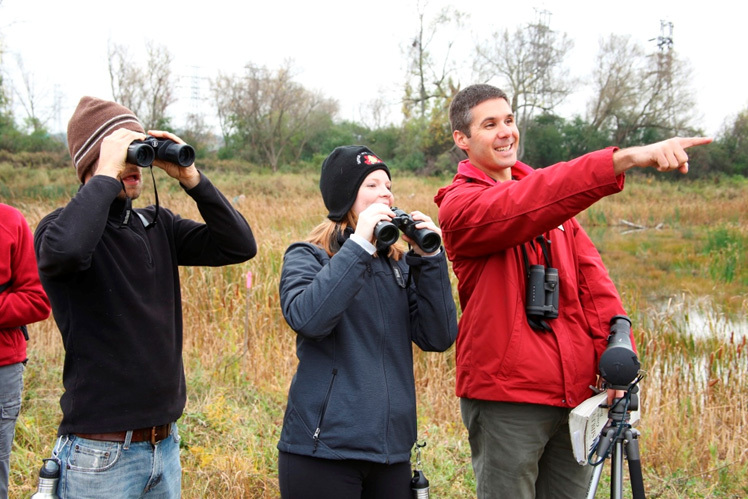 October 2014 - Brian Cocca (left) and Liverpool Middle School math teacher Sara Pieklik (center) spot birds. 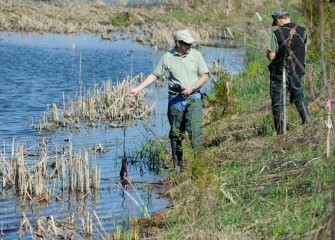 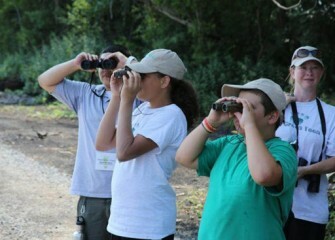 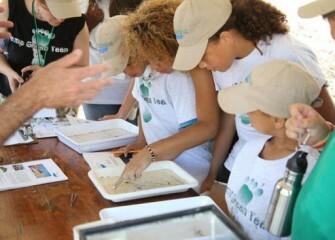 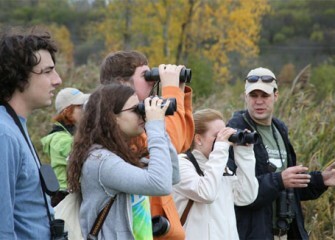 In total, 28 species were observed during the 3-hour event. 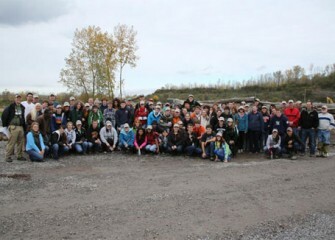 October 2014 - Richard Askeland of Syracuse has participated in several Corps events. 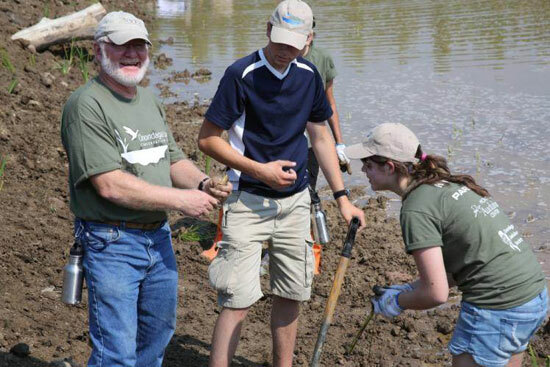 Richard believes Onondaga Lake is an important natural feature of the area, and in order improve it everyone has to do their part. 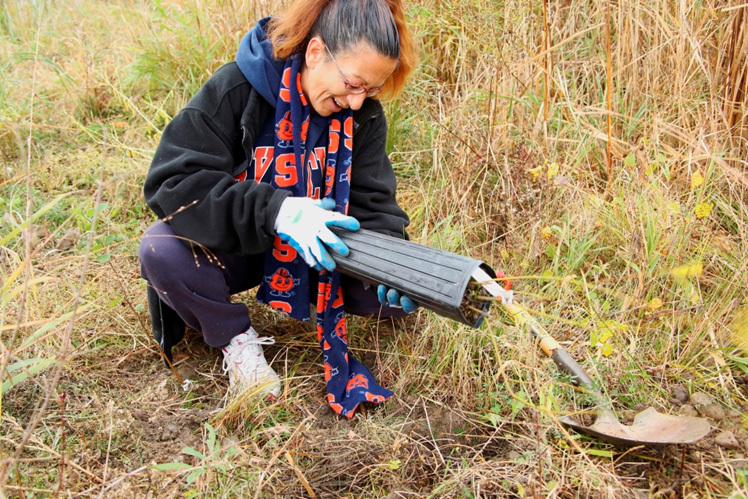 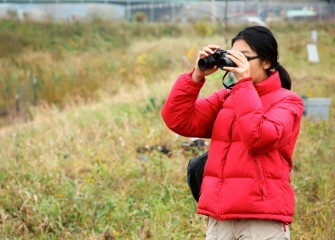 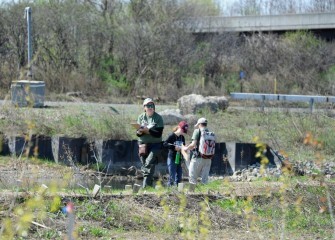 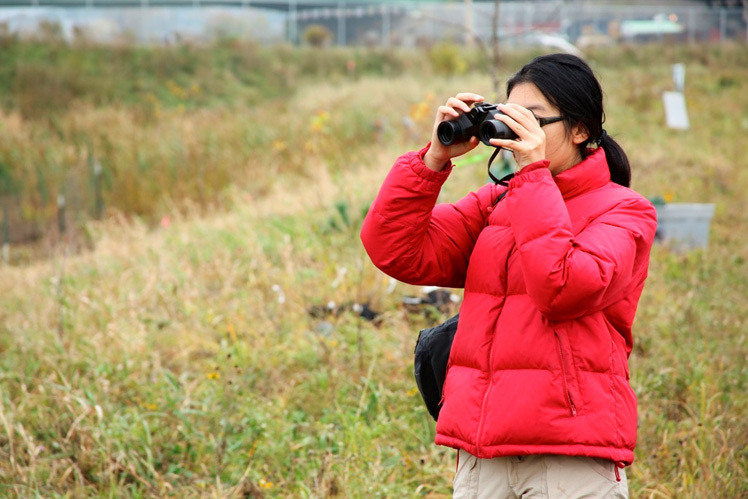 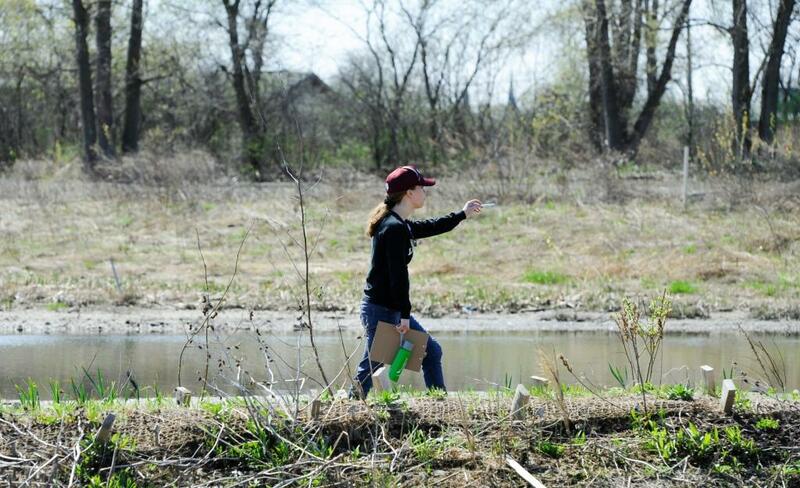 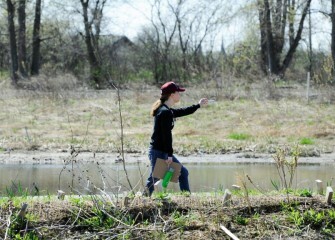 October 2014 - Wendy Huang, SUNY-ESF student, assists with citizen science monitoring near Geddes Brook, which is part of the Onondaga Lake Important Bird Area watershed. 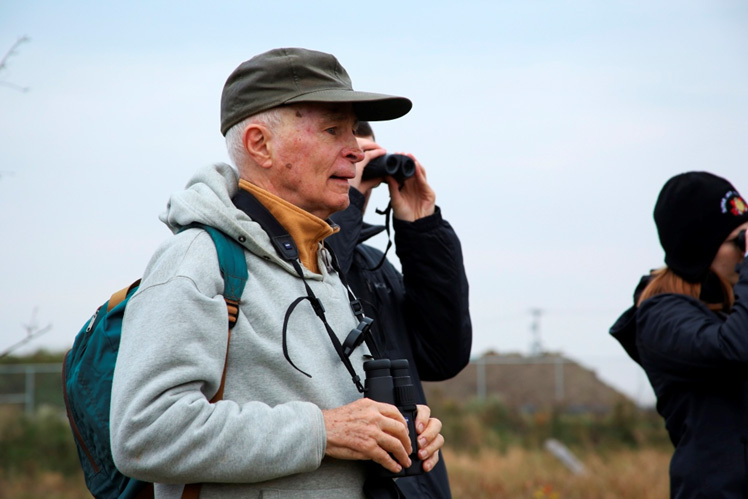 October 2014 - Brad Phelps and R.J. Herrick of Tully track native birds along Geddes Brook. 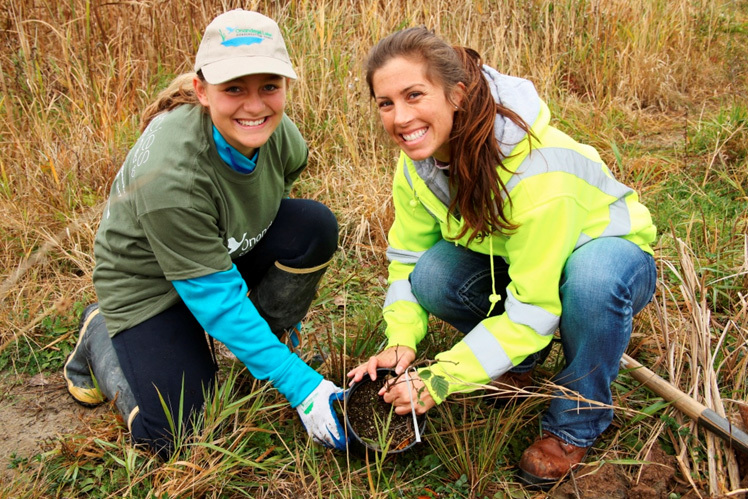 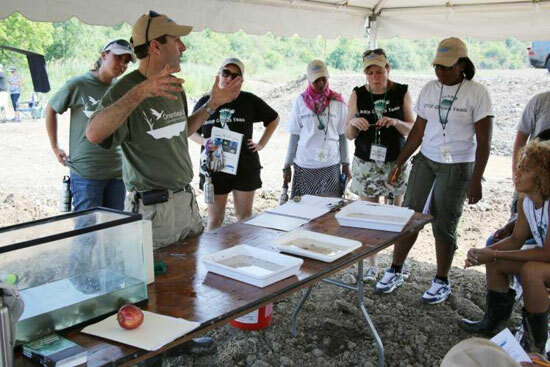 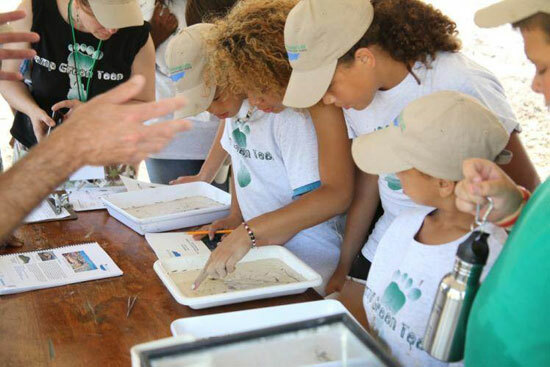 October 2014 - Erin Crotty (right), executive director of Audubon New York, also participated in the Corps event, noting that a diverse wetland now provides vital nesting, shelter, and food to several Audubon conservation species. 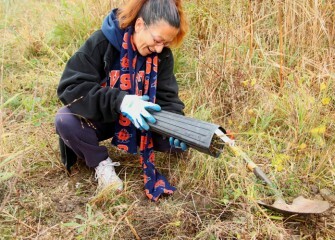 October 2014 - Margaret DeCarlo of Clay loosens a silky willow tree, a native species, from its pot. 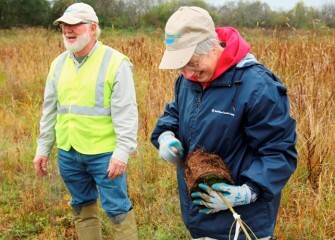 October 2014 - Sue Boettger (right) of Fayetteville roughens the root ball of a black willow before planting. 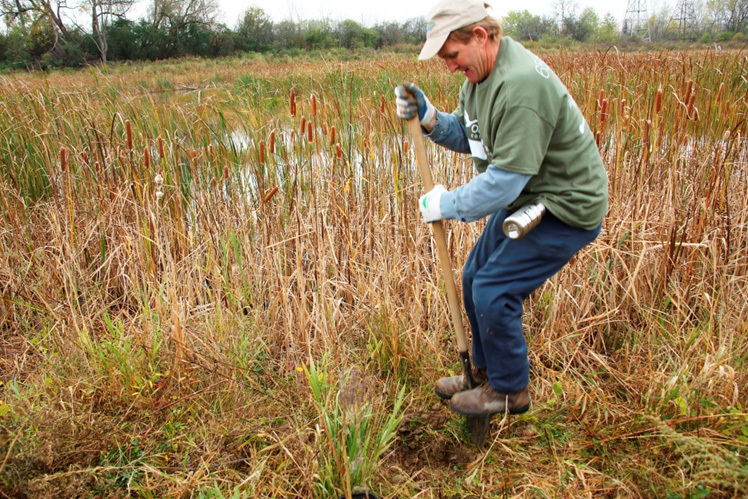 October 2014 - Patrick Higgins of Clay puts his weight behind the effort to plant a new tree in the wetlands. 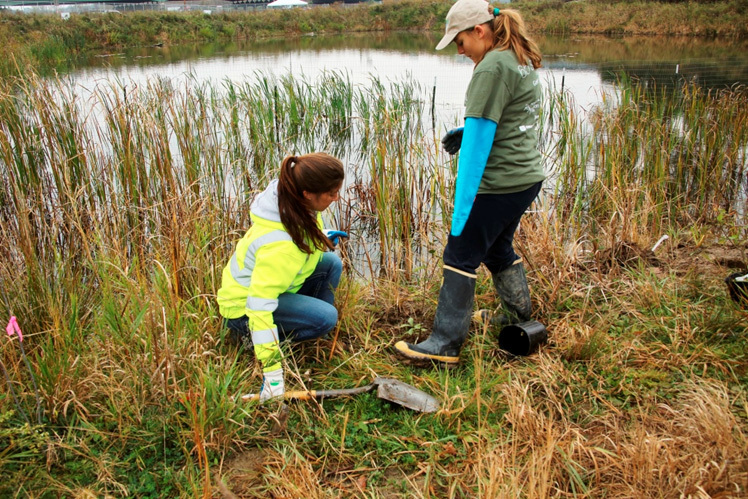 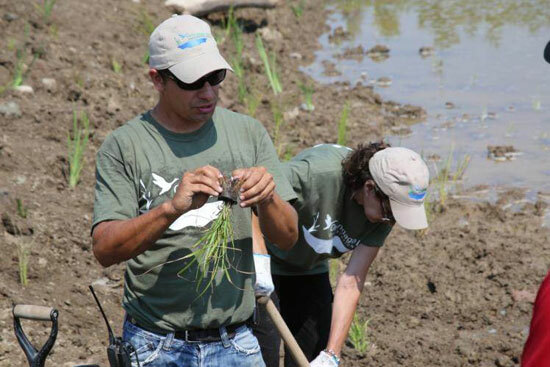 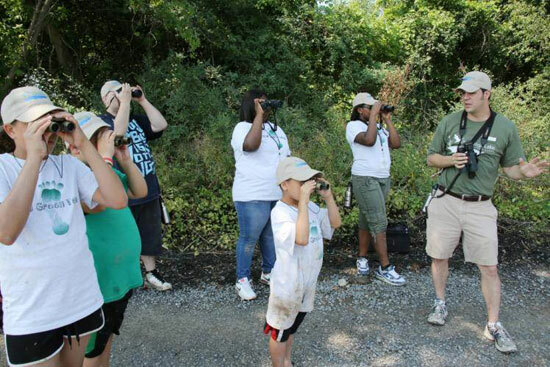 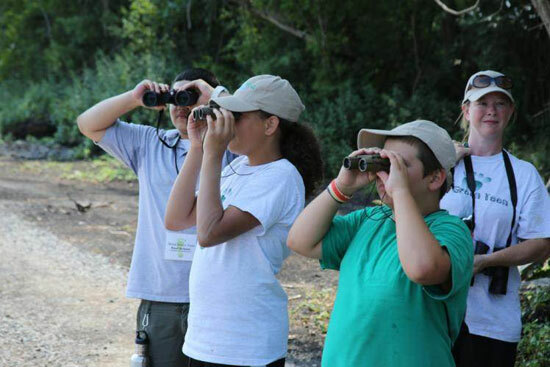 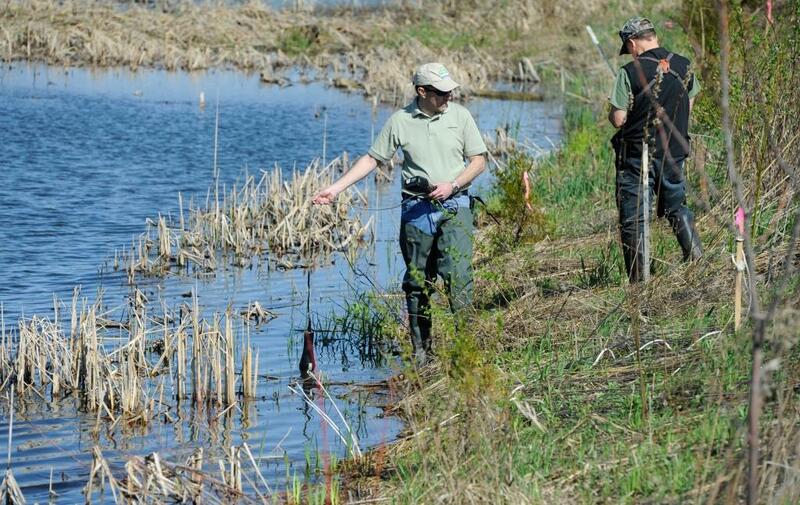 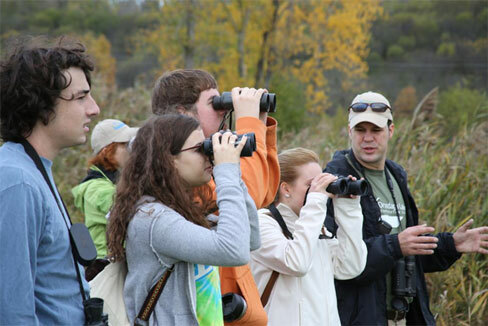 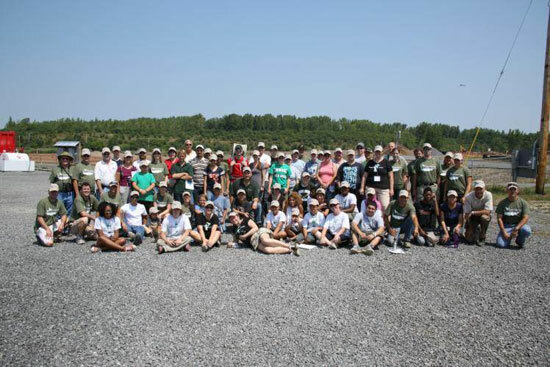 October 2014 - To date, over 500 volunteers have joined grassroots efforts by the Onondaga Lake Conservation Corps to improve habitat for a diverse population of fish, birds, and mammals. 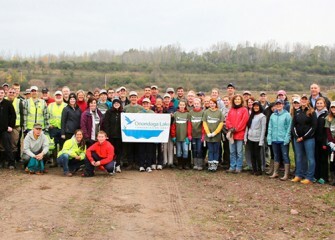 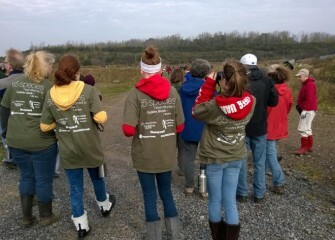 October 2012 - Eighty-six volunteers from Central New York participated in the third Onondaga Lake Conservation Corps stewardship event at Nine Mile Creek and the Geddes Brook wetlands on Saturday, October 20. 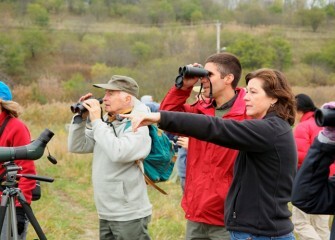 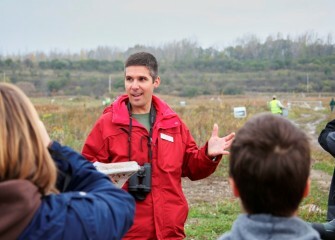 October 2012 - Frank Moses, director of the Montezuma Audubon Center, leads volunteers from the State University of New York College of Environmental Science and Forestry (SUNY-ESF) on a birding walk to track native birds. 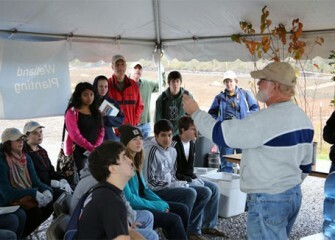 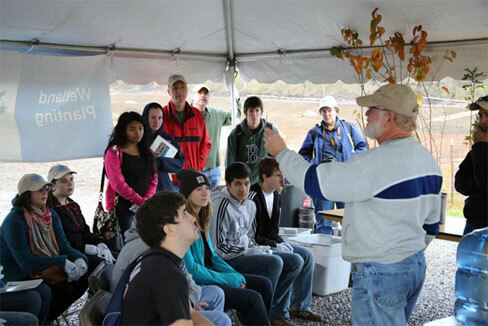 October 2012 - Volunteers learn about wetlands from Joseph McMullen, principal environmental scientist at Terrestrial Environmental Specialists, Inc.
October 2012 - Volunteers from Westhill High School participate in the third Onondaga Lake Conservation Corps stewardship event. 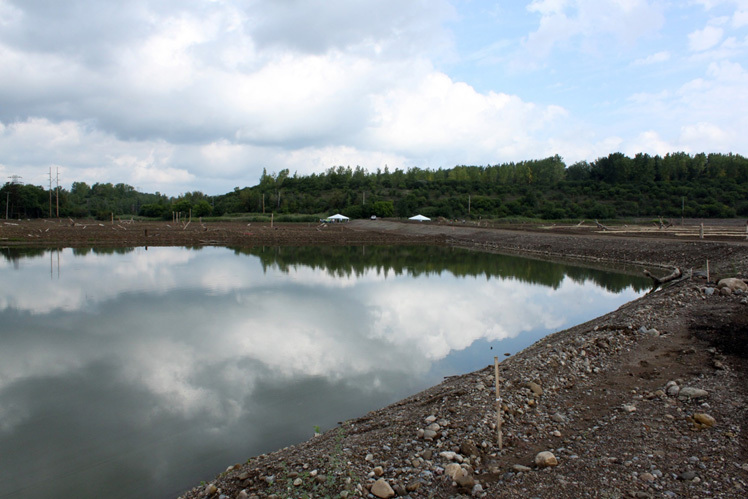 August 2012 - Geddes Brook wetlands soon after construction, when one of the first Corps planting events took place. 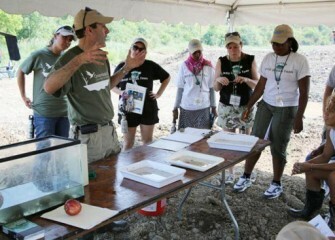 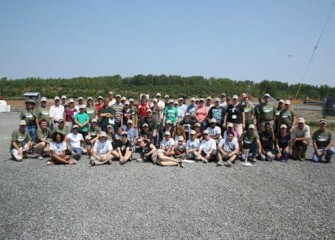 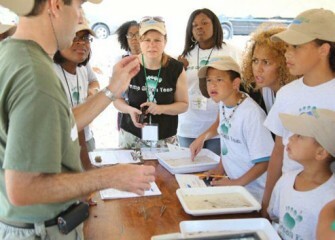 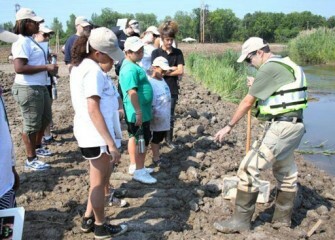 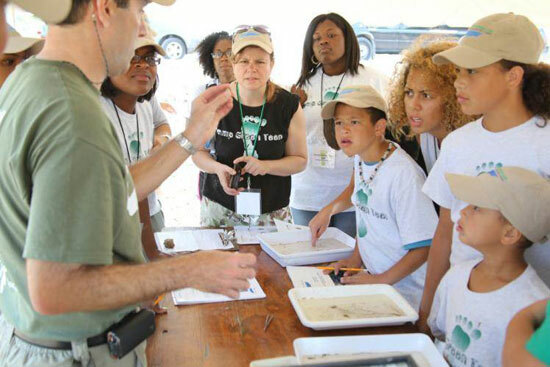 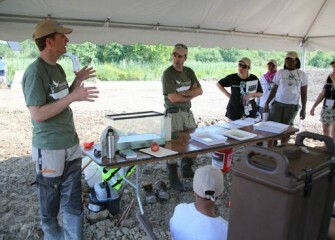 July 2012 - Ryan Davis, Principal Scientist, Anchor QEA, answers questions from volunteers about monitoring of wetland habitats. 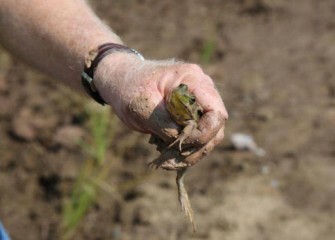 July 2012 - Joe McMullen, Principal Environmental Scientist, Terrestrial Environmental Specialists, finds a frog while planting. 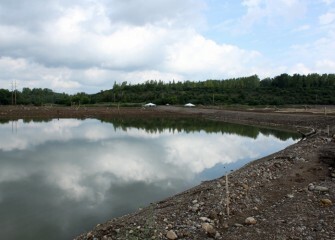 July 2012 - The re-established wetland will provide shelter, cover, and food to support movement of fish and other wildlife in the wetlands. 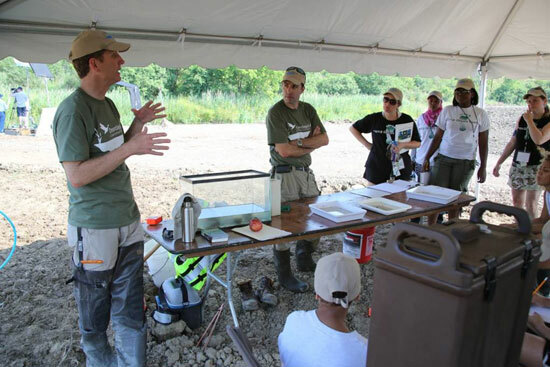 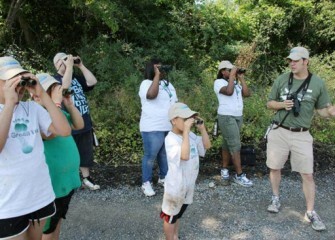 July 2012 - The event helped to raise awareness of Onondaga Lake as an Important Bird Area (IBA), emphasizing the importance of bird and habitat conservation within the Onondaga Lake watershed to the Greater Syracuse Community. 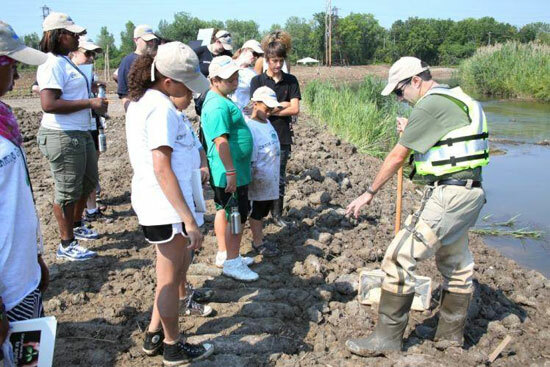 July 2012 - Heather Philip, Geologist, Parsons, teaches Onondaga Lake Conservation Corps members how to plant native aquatic plants. 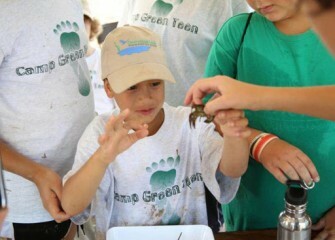 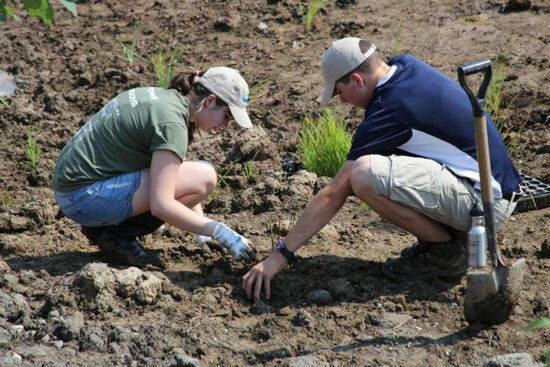 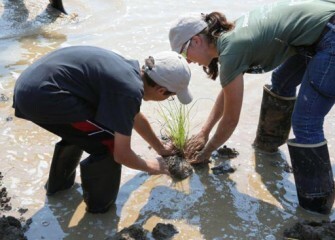 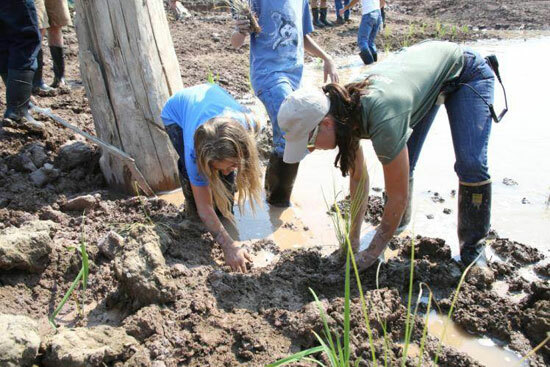 July 2012 - Hailey Higgins (right) was present at the inaugural event of the Onondaga Lake Conservation Corps when community volunteers got their hands dirty planting native species, becoming environmental stewards of the Onondaga Lake watershed.